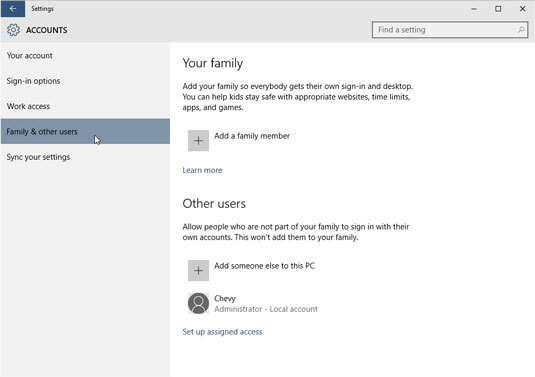 Adding a family member to your user accounts in Windows 10 adds an important distinction to the account. If you add a child, the child’s activity will be curtailed according to the limits you set. And if you add an adult, that person will also have the ability to monitor the activity of any added children. If you want to add an account that’s not involved in these family matters, choose the other option, called Adding an Account for Someone Else. There, you can create an account for a roommate or long-term guest. Click the Start button and click the Settings button. When the Settings app appears, click the Accounts icon. The Accounts screen appears, as shown in the following figure, offering ways to change your own account, as well as how to add accounts for other people. Click the words Family & Other Users to create a new user account. While you’re here, you can tweak your own account by clicking Your Account on the left pane. You can change the password of a Local account, for example, or even switch form a Microsoft account to a Local account. The right pane of the Family & Other Users screen, shown here, lets you create either of two accounts: One for a family member, or one for someone else. If you’re creating an account for a family member, move to Step 4. If you’re not adding a relative, jump ahead to Step 5. Add family members, including children, by clicking Add a Family Member. Choose Add a Family Member, and follow the steps to send the person an invitation. If you don’t know the person’s e‐mail address, click the words, The Person I Want to Invite Doesn’t Have an E‐mail Address. That takes you to a page where you can sign them up for an e‐mail address that also serves as a Microsoft account. 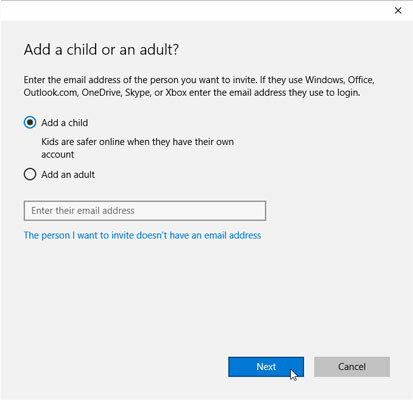 Choose whether you’re adding a child or an adult and type in their e-mail address. No matter which option you choose, your invited family member, either a child or adult, will receive an e‐mail saying they’ve been invited to have a family account on your computer. Once they accept the offer, they automatically appear as an account on your computer. At this point, you’ve finished adding a family member. To add somebody who’s not a relative, move to Step 5. Choose Add Someone Else to Your PC. 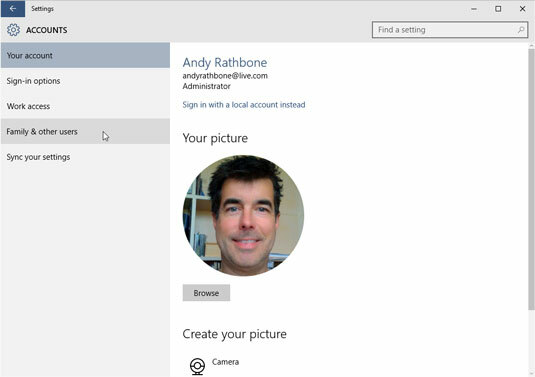 Microsoft immediately complicates matters, as shown in the How Will This Person Sign In? window, by asking for the new account holder’s e‐mail address. Enter an e-mail address to sign up for a Microsoft account. Microsoft account: A Microsoft account is required for many Windows 10 features. A Microsoft account is simply an e‐mail address that links to Microsoft, its computers, and its billing department. Only Microsoft account holders can download apps from the Windows Store app, store files on an Internet storage space called OneDrive, and access other perks offered by a Microsoft account. To create a Microsoft account, go to the Step 6. Local account: Select this option for people not interested in Microsoft accounts and their privileges. It lets the person use your computer with an account specific to your computer. To create a Local account, click the words Sign in Without a Microsoft Account (Not Recommended) and then jump to Step 7. Type the e-mail address of the new account holder’s Microsoft account into the Email Address text box, click Next, and then click Finish. The account will be waiting on the Sign In screen. When the person wants to use the computer, he chooses the account bearing his e‐mail address and then types in his Microsoft account password. 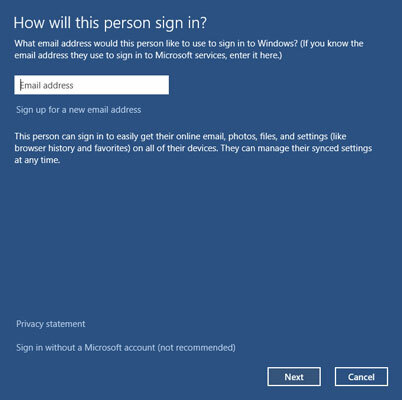 Windows visits the Internet, and if e‐mail address and password match, the account is ready for action. You’ve finished. Click the words Sign In without a Microsoft account (Not Recommended), shown at the bottom of the last figure. Alarmed that you’d consider choosing a lowly Local account over the wondrous Microsoft account, Microsoft displays a confirmation page with two buttons: Microsoft Account and Local Account. Click the Local Account button. A new screen appears, asking for a name for the account (username), the account’s password, and a password hint in case you forget the password. Enter a username, password, and password hint and then click Next. Use the person’s first name or nickname for the username. Choose a simple password and hint; the user can change them after he signs in. Tell the person his new username and password. His username will be waiting at the Sign In screen’s bottom-left corner for him to begin using the computer. Windows normally creates Standard accounts for all new users whether or not they’ve signed in with a Microsoft or Local account. You can upgrade that later to an Administrator account if you want by changing the account.